When creating Toraverb, D16 did not base it on any current reverb unit available in the market. They did not implement any "off-the-shelf" algorithm. Toraverb is not a classic type reverb unit like spring, room, hall or plate. 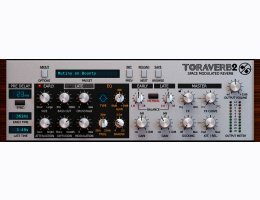 Toraverb is a concept algorithm reverb. Using a set of easily accessible parameters, it allows the user to create practically ANY type of reverb. Their goal was to create a reverb which would sound pleasant to the listener and the output could be tweaked in many ways by the user. Reverb is a critical effect in a mix. Result depends on the reverb algorithm used and the quality of the implementation. Usually reverb is used as a send effect in which many channels in a mix are routed to it. If a low-quality plug-in or hardware unit is used, the end results can sound very disappointing with the reverb tail sounding like it had been “ripped-off” in the mix. In Toraverb, D16 applied diffusing network of the highest possible quality based on modified all-pass filters. By doing this and using properly tuned parameters, we can almost eliminate unwanted flutter echo effects for every sound source. Toraverb is equipped with two independent, single band, fully parametric equalizers with 3 available curve types each. One is used to EQ early reflections and the other to EQ late reflections. This is an incredibly useful feature which provides a lot of control over the character of the reverb allowing to achieve most natural sound. Toraverb also has an additional modulation parameter, which affects the diffusing network. These are responsible for the distribution of the sound waves reflections in time. By changing the modulation, the sound of the reverb tail can be altered to give a more realistic effect of sound propagation. Modulation amount is controlled independently for early and late reflections. To give a better impression of physical space, D16 have added an innovative spatial reflection algorithm to Toraverb. It improves spatial reflections by allowing cross-talking of reflected stereo waves between stereo channels. This models what happens in the real world when a sound audible only in the left ear is reflected and is heard in both ears. For convenient blending Early and Late reflections together. Now with balance parameters, for both reflection types, working in Left / Right or Mid / Side domains yet expanding palette of possibilities. Essential functionality in the most studio situations. Toraverb features a built-in ducker, which's compresses FX signal's amplitude proportionally to the loudness of dry / unprocessed input, thus saving an overall output signal energy. Such a tool built into the plug-in is a real time-saver for any music producer or studio engineer. No need to employ any additional side-chain compression unit into your fx chain and simplify this aspect of use to the minimum. Click on the 'Demo' button on the Toraverb 2 product page and Download a demo version of D16's Toraverb 2.